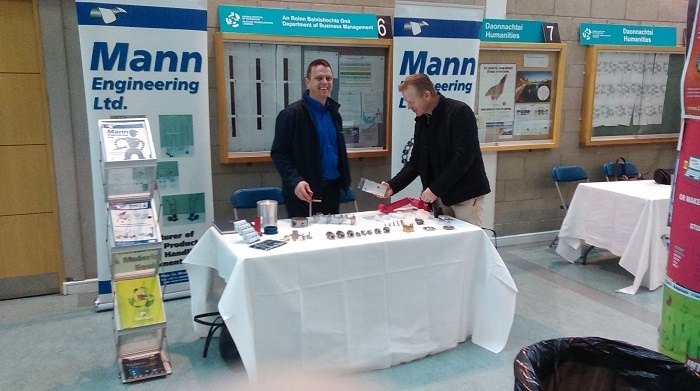 Mann Engineering recently displayed at the “Industry 4.0” exhibition event in the Limerick Institute of Technology recently. It was a fantastic experience seeing how Irish manufacturing has developed over recent years and how we compare so favourably with European manufacturing technologies. Along with the exhibition, there was also an well attended Industry Seminar – “Meeting the needs of Industry 4.0” which along with the exhibition showcased some of the capabilities of the Mid-West and beyond in Industry 4.0 as an opportunity for competitive advantage. It is named the Industry 4.0 to showcase the fourth industrial revolution. The first revolution was, of course mechanised production using water and steam power, the second saw the growth of mass production using electrical power, and the third was the digital age, the fourth industrial revolution encompasses smart sustainable businesses increasing production using electronics and IT. This was a great opportunity to learn about new concepts and technologies and to meet and network with companies in the region. This not only helps give our business a competitive advantage but we also hope to form long lasting and mutually beneficial relationships within the industry so we can grow our knowledge and always be at the cutting edge of engineering.